No big deal, not like the Raptor needs any structural integrity or anything. In 2008, reported that the 2009 Ford F-Series was offered with so many options and variations in its lineup that 10 million different trucks could leave the factory, none with the exact same spec as the others. One may marvel at that feat of industrial might, especially after driving a few separate models and realizing how solid they are, but sooner or later those odds do nothing but exacerbate Murphy’s Law and increase the chances that something will go wrong. And something has. Somewhere during the production of the 2015 F-650 and F-750, the 2018 F-150 Raptor SuperCab, and 2017 F-150 and Super Duty trucks, Ford made a few mistakes. The Blue Oval has issued multiple recalls to remedy those issues, which, according to the raw numbers, seem to impact a very small percentage of vehicles relative to the number of F-Series trucks that Ford moves. In regards to the to 2015 F-650 and F-750, vehicles you won’t have to worry about unless you drive tow trucks for a living, Ford is concerned with only 77 models that “contain castellated nuts at the tie rod ends that were torqued below the minimum torque specification.” The problem with under torqued bolts is that they tend to come loose. In this case, they’d cause the tie rod to become loose in the steer axle, causing it to disconnect from the steering system. When that happens, the driver looses control of the passenger-side wheel. The fix is simple as it only requires dealers to torque the bolts to spec. Ford is also recalling 624 2017 F-150 and Super Duty trucks, for insufficient weld penetration on the seat belt buckle attachment bracket on the front passenger manual seats. Don’t even try to imagine the implications of that during an accident, but suffice it to say Ford wants to replace the component so that it doesn’t go down in flames during court hearings a-la-GM ignition scandal. 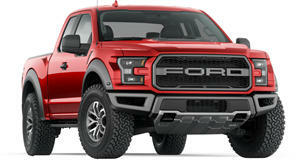 And that leaves us with the 2018 Ford F-150 Raptor SuperCab. Given its nature, it's arguably the F-150 that , but according to the latest recall, Ford may have seriously dropped the ball. That's because 42 of these, none of which are equipped with the moonroof option, left the factory with missing rivets in the roof brace structure. How that happened is anyone’s guess. Maybe the factory workers were too excited to put these hellacious machines on the dunes? In either case, the lack of roof rivets reduces structural integrity and increases the risk of injury in a rollover accident. The fix for such an egregious mishap involves nothing more than installing those missing rivets, which should also have the double effect of reducing interior squeaks after performing jumps on the dunes.